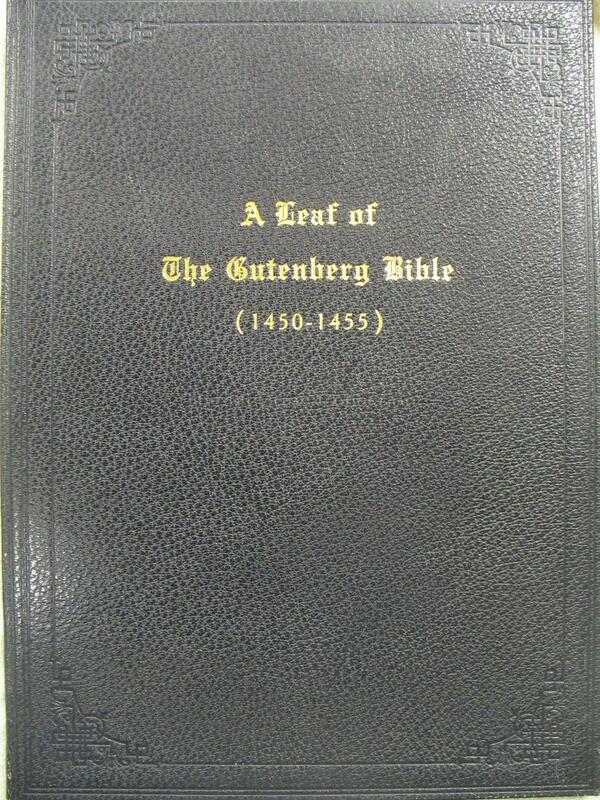 This copy of the Mazarin Bible (also known as the Gutenberg Bible and as the 42-line Bible - often shortened to B42) had been owned by Maria Elisabeth Augusta von Sulzbach (1721-1794), the wife of Carl Theodore (Karl Theodor), Electoral Prince of the Palatinate [who later became Electoral Prince of Bavaria in 1777]. 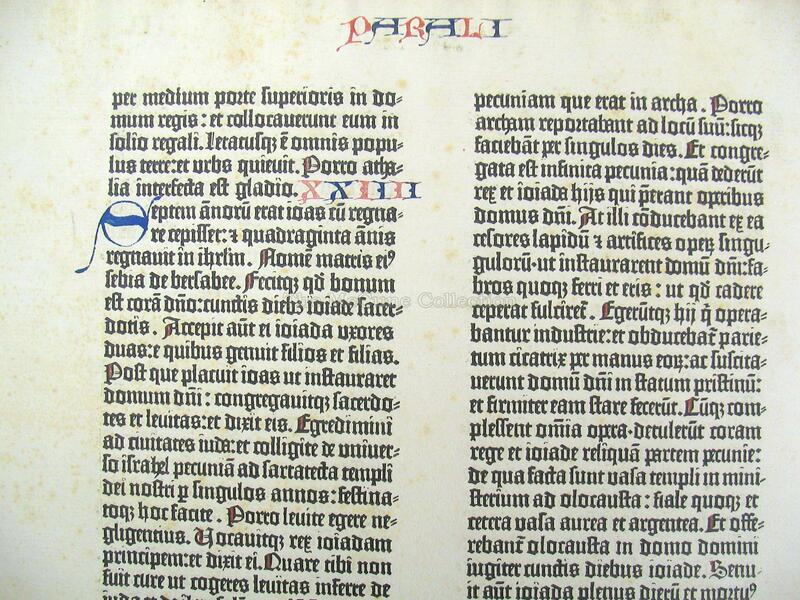 The bible was held at the Mannheim Hofbibliothek and then later at the Staatsbiliothek (Royal Library) in Munich. 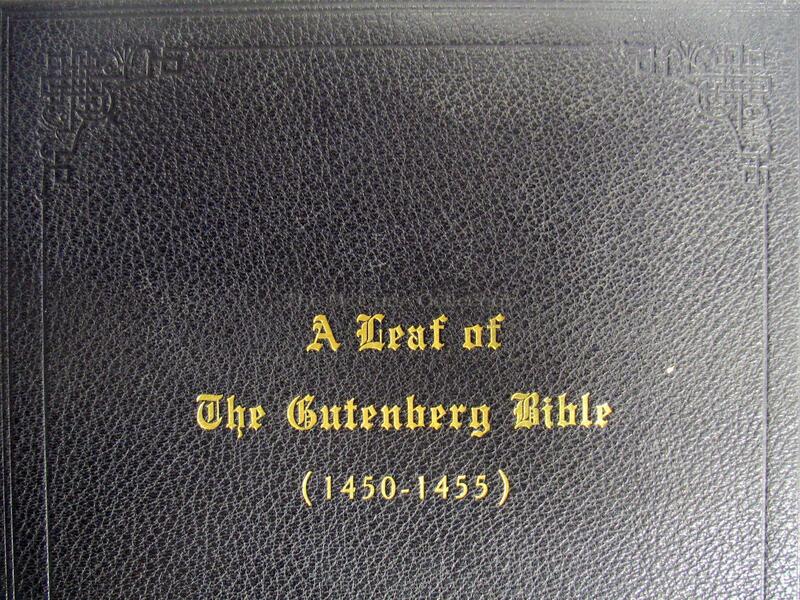 In 1832, the book was sold as a duplicate since the Royal Library already had two other Gutenberg Bibles. It was purchased by Robert Curzon, Baron Zouche (1810-1873) for 350 guilders. It was held by his descendants until 1920 when Mary Cecil Frankland ,Baroness Zouche (1875-1965) put it up for auction. 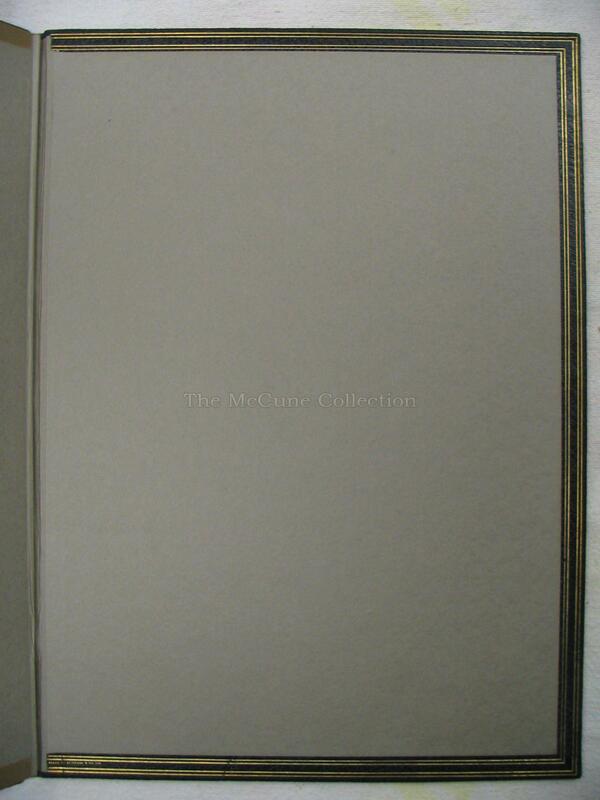 It was sold at Sotheby’s auction (November 9 – Lot 70) to Joseph Sabin. J. Sabin’s Sons was a respected firm of book dealers. It was a family business that existed under the Sabin name from 1842 to1934, with offices in both New York and London. [Note: In the 1920s there were two Joseph Sabins at the business - Joseph Fred Sabin (1846-1926) and Joseph Percy Sabin (1872-1934).] 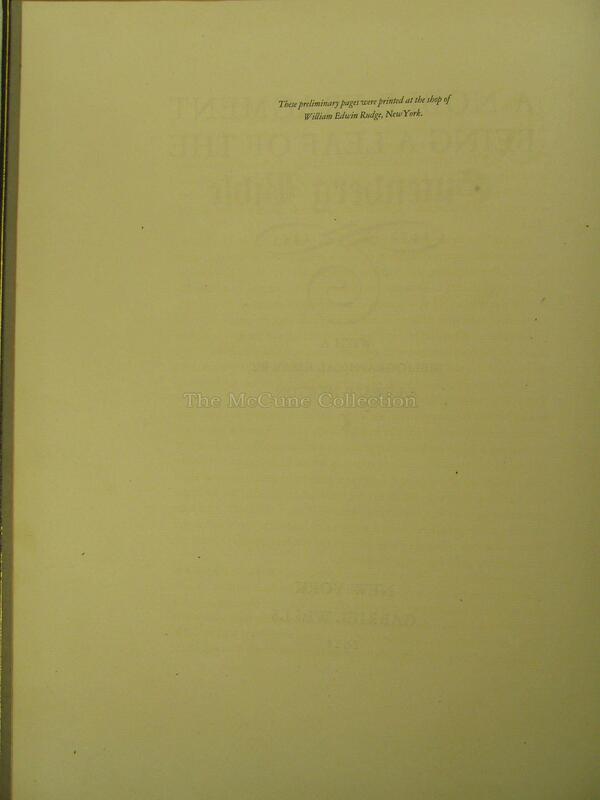 Sabin in turn sold it to Gabriel Wells (1862-1946), a New York book dealer. 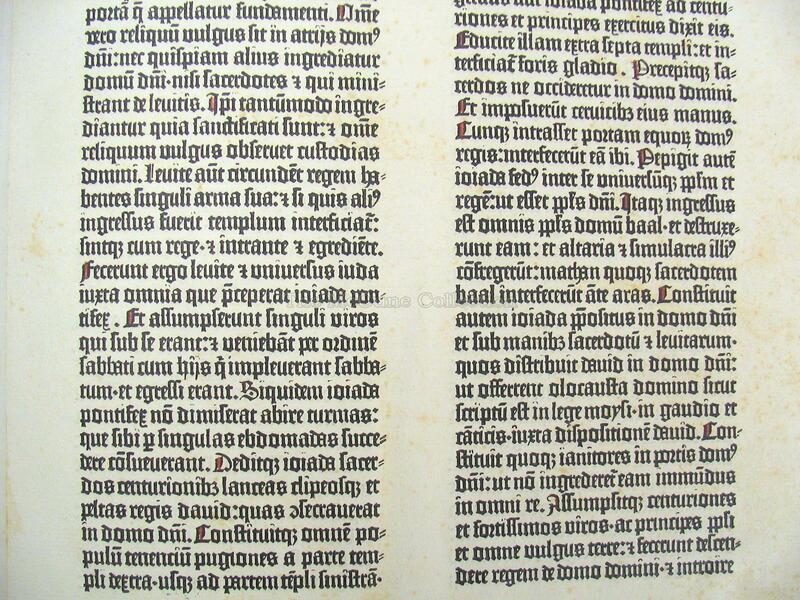 This two-volume Gutenberg Bible had only 593 of its 643 leaves and some of the remaining leaves had the illuminations cut out. For this reason, Wells decided to break up the Bible and sell it piecemeal. 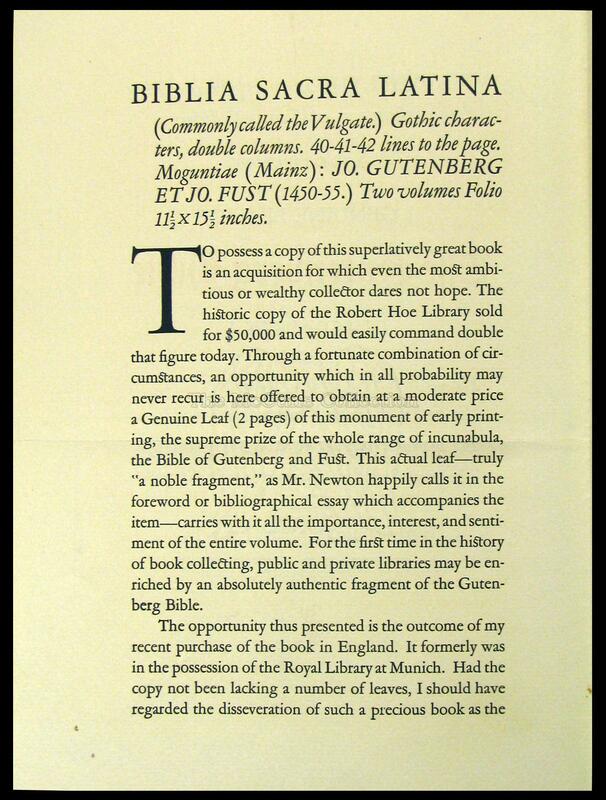 Wells issued a three-page brochure to announce the sale of the Gutenberg leaves. 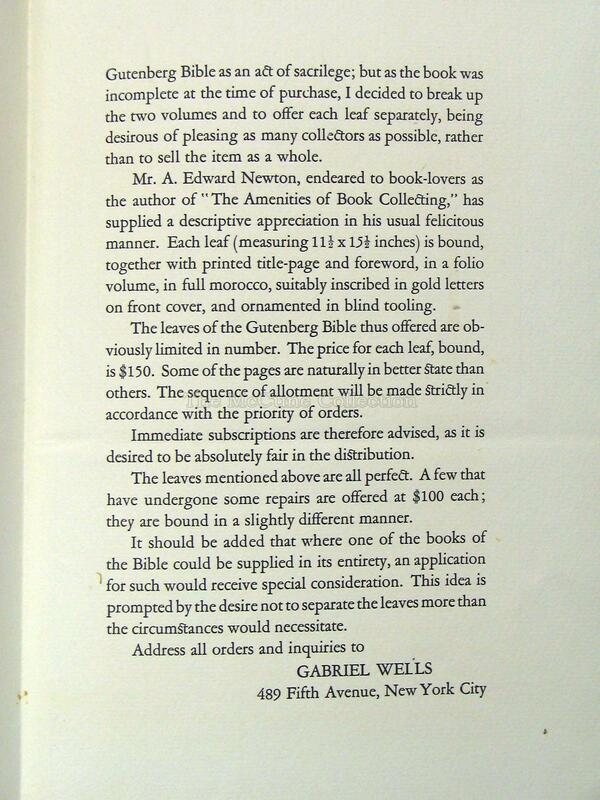 In the brochure he explained why the Bible was being broken up, the expected sales price, what buyers could expect to receive and that orders should be sent to his office on Fifth Avenue in New York City. 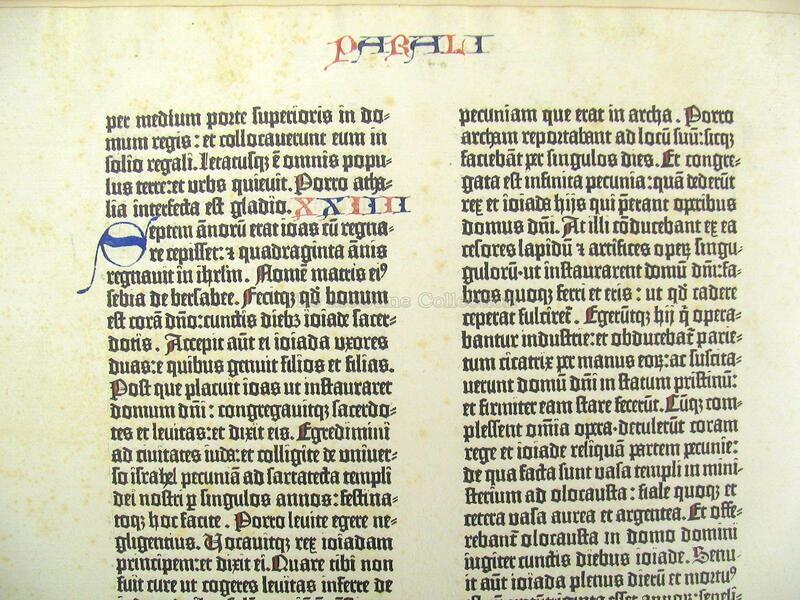 Although Gabriel Wells sold the bulk of the Bible as individual leaves, he actually broke the Bible up (he called it “disseveration”) into three classes: (1) complete and perfect chapters, (2) selected leaves (two pages) and (3) leaves which had been soiled, stained, or repaired. 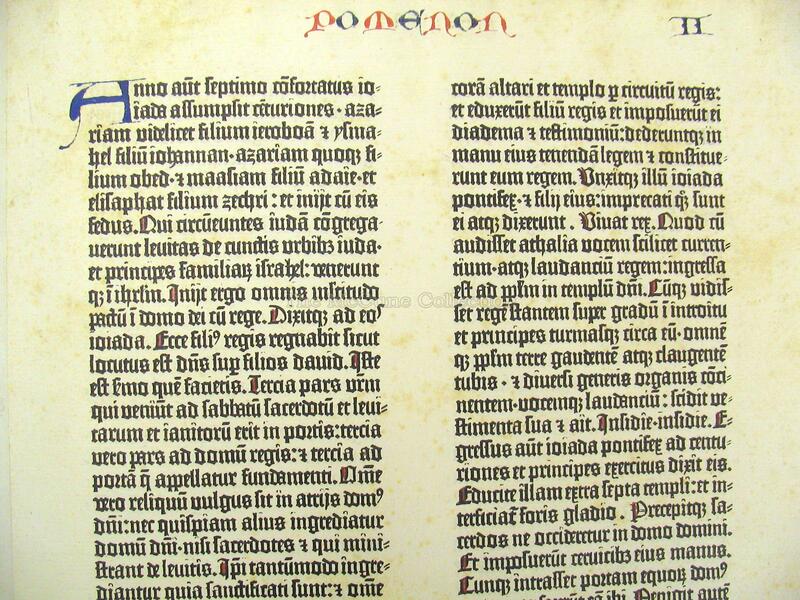 The Gospel of St John, Timothy I and II, the Book of Daniel, and the Book of Genesis were all reported as being sold in complete sections to individual buyers. As was to be expected, there was fierce competition to obtain certain parts of the Bible, such as the perfect chapters, the Ten Commandments, Sermon on the Mount, etc. The normal price paid for each leaf was $150 although the damaged leaves were sold for slightly less at $100 each. 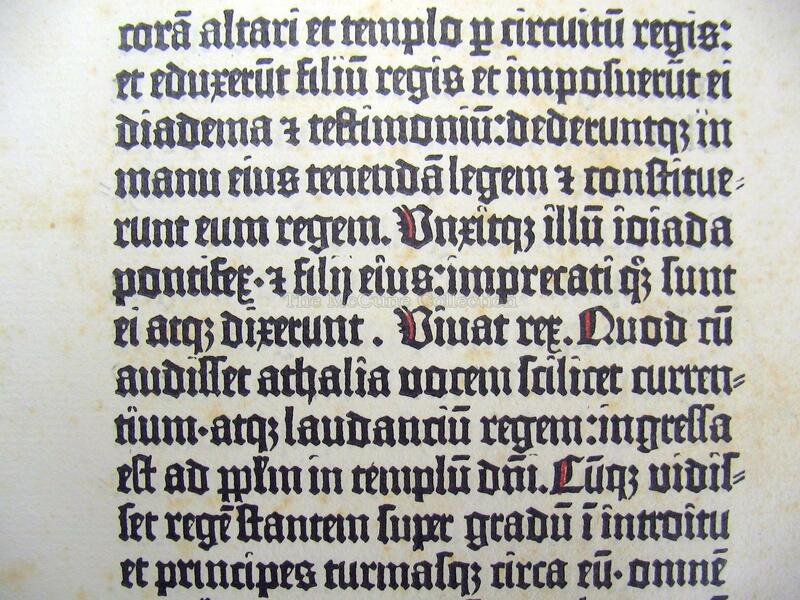 Wells also felt that he was giving a great opportunity to scores of individuals and institutions to obtain at a moderate price a genuine leaf of this monument of early printing. A number of institutions took him up on his offer: McGill University, Toledo Museum of Art, Massachusetts Institute of Technology, the Smithsonian Institute in Washington, D.C., University of Pennsylvania, Vassar College and others. 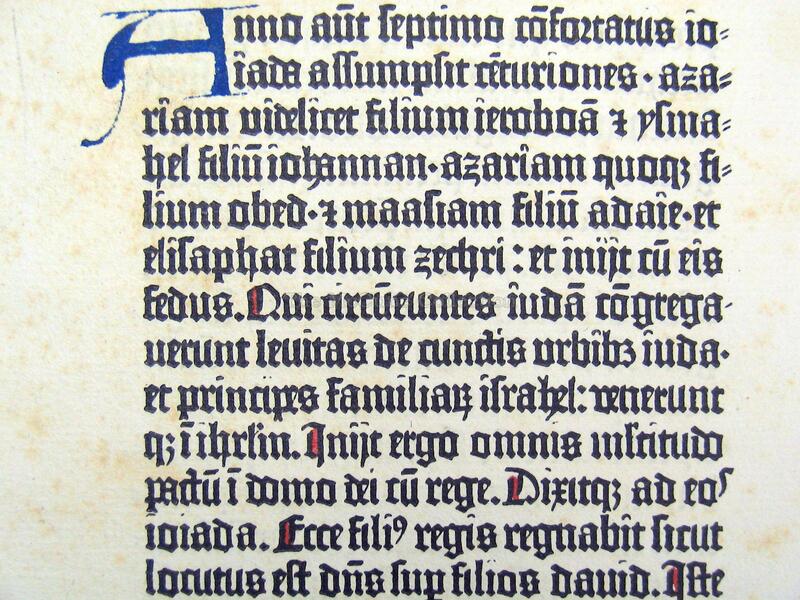 Wells made a gift to the New York Public Library of several pages that were missing from its copy of the Gutenberg Bible, supplying all but one of the needed pages. 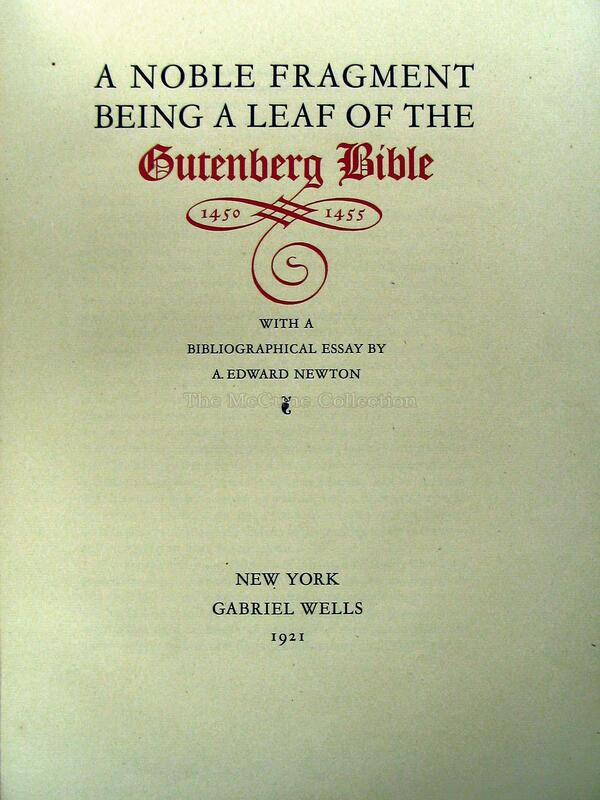 Wells hired A. Edward Newton to prepare an essay about the Gutenberg Bible to be included with the leaves. 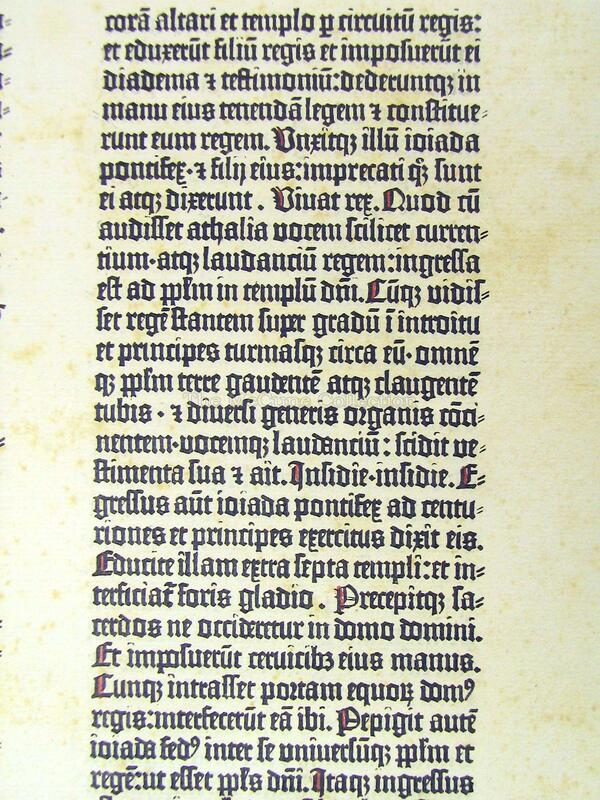 This was entitled “A Noble Fragment Being A Leaf of the Gutenberg Bible 1450-1455 With A Bibliographical Essay By A. Edward Newton. New York. Gabriel Wells. 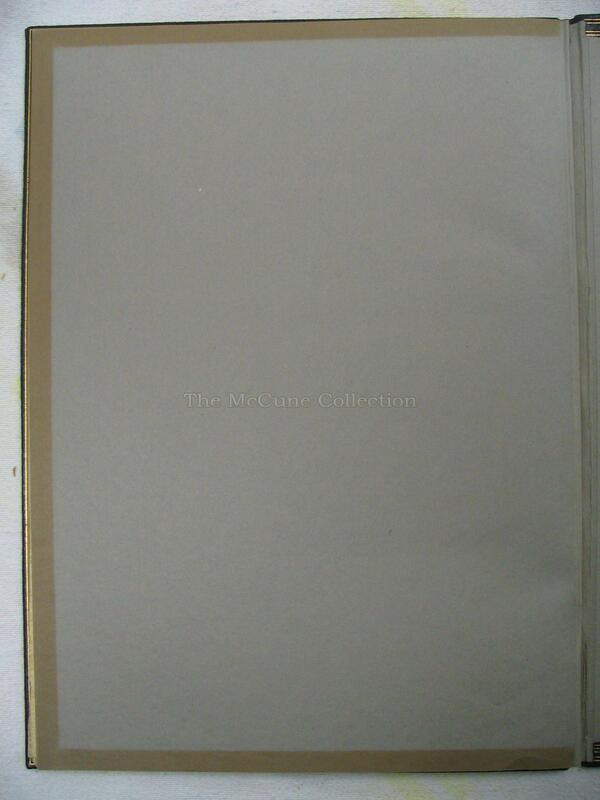 1921.” Including the title page, the essay is five pages long. 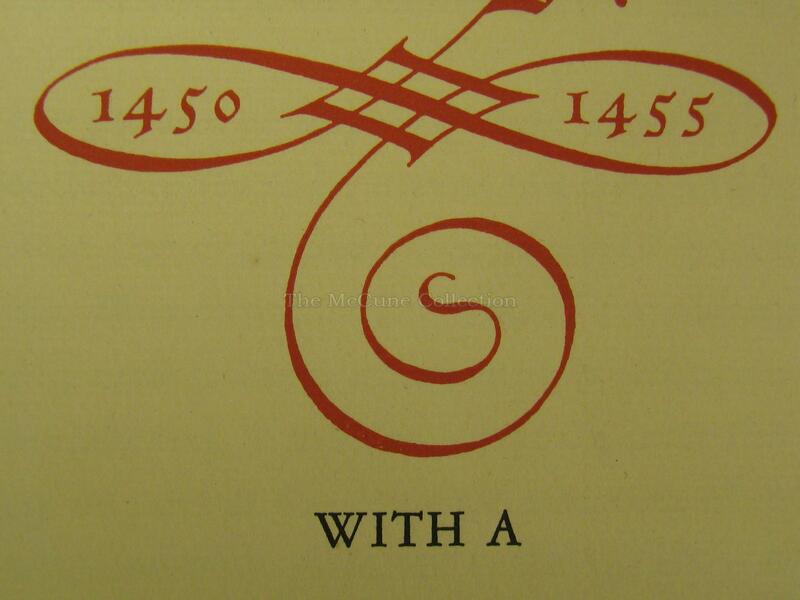 It was printed at William Edwin Rudge’s shop in Mount Vernon, NY under the direction of Bruce Rogers. 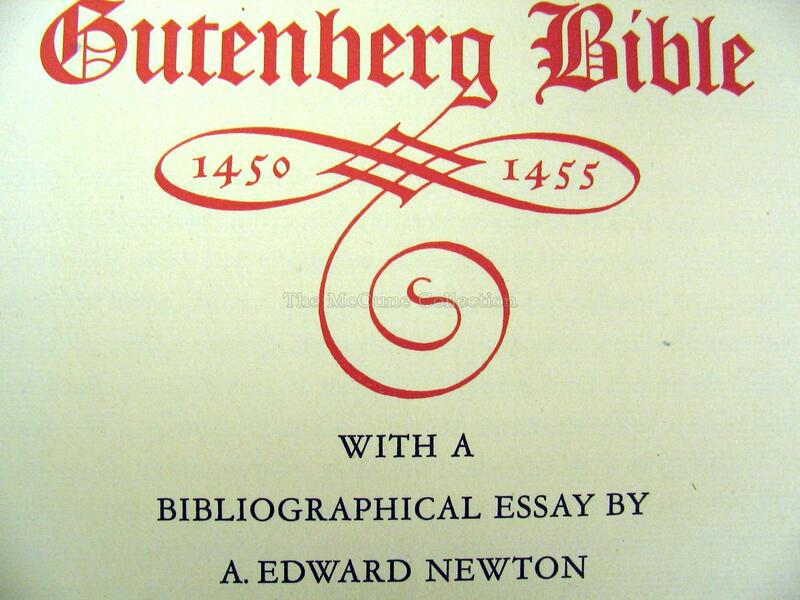 The title of the essay is in black with “Gutenberg Bible” in red, and a red decoration showing the years 1450 and1455. 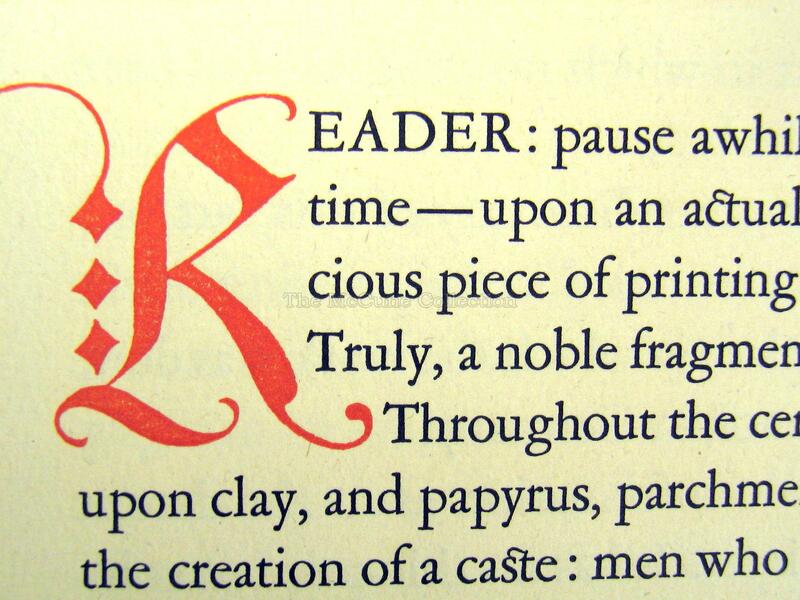 The first letter in the essay is a five-line red capital “R” with extensions. .[Note: The Houghton Library, Harvard College Library, Harvard University is the repository of a collection of certain Bruce Rogers papers and designs. 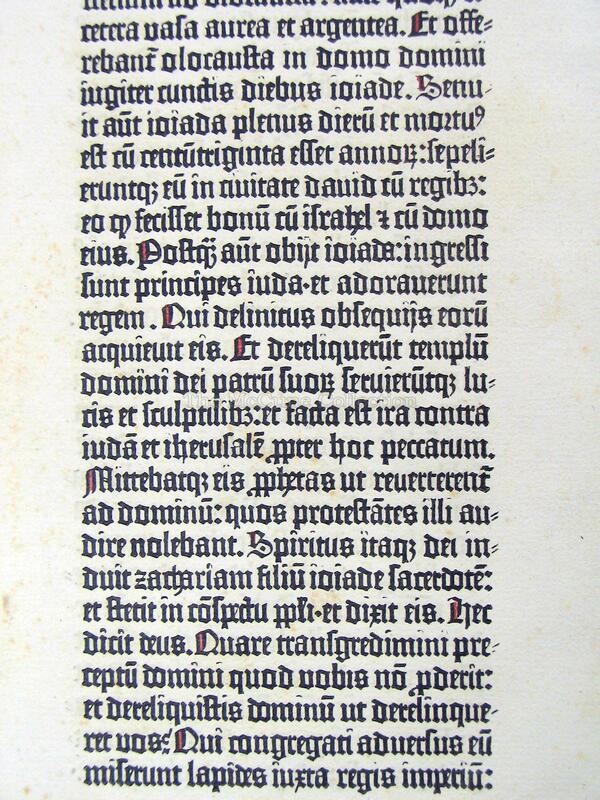 In this collection, under “Undated publications” is listed a reference to a [Gutenberg Bible 1450-1455] 1 item: (#115) “Ink and white wash design, with notes to printer, for initial letter R and title Gutenberg Bible 1450-1455.”]. 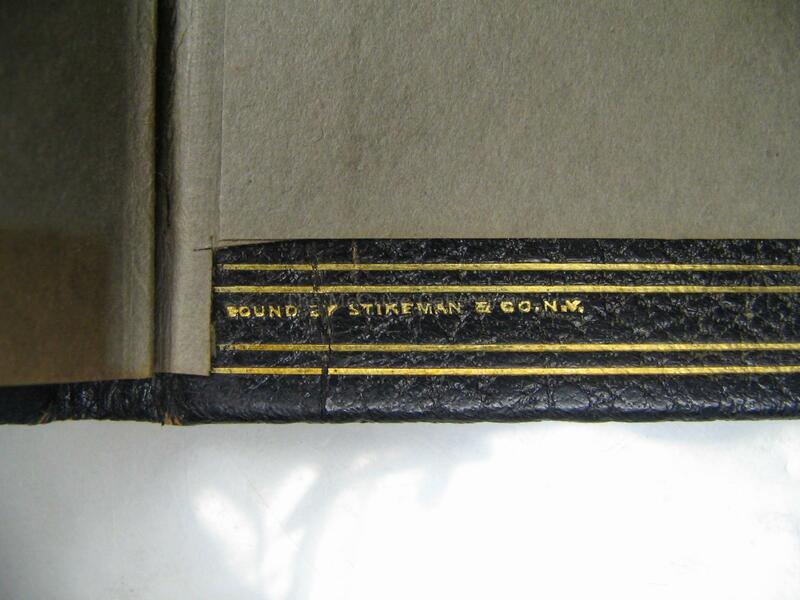 The leaves were placed in a black or dark blue morocco goatskin portfolio folder made by the renown bookbinding firm of Stikeman & Co. (New York). 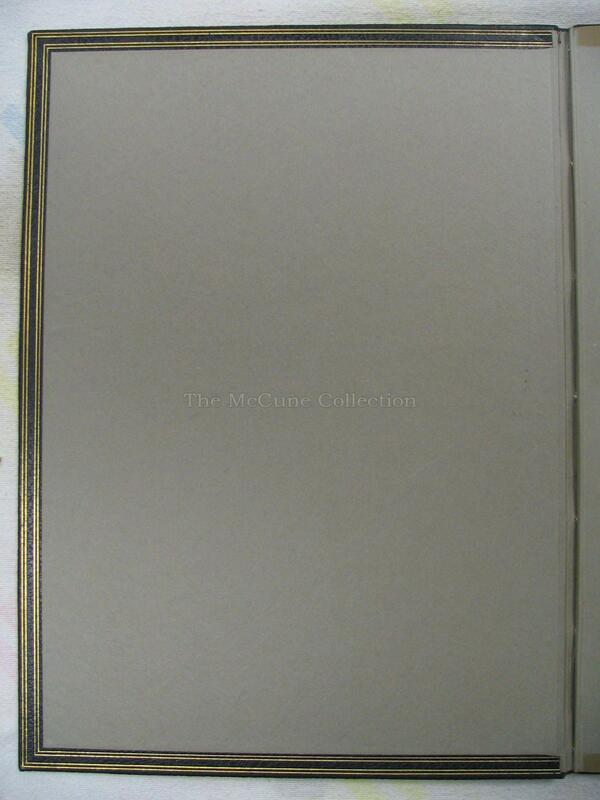 The folder is tooled with blind arabesques in the four corners of the covers and with doublures. 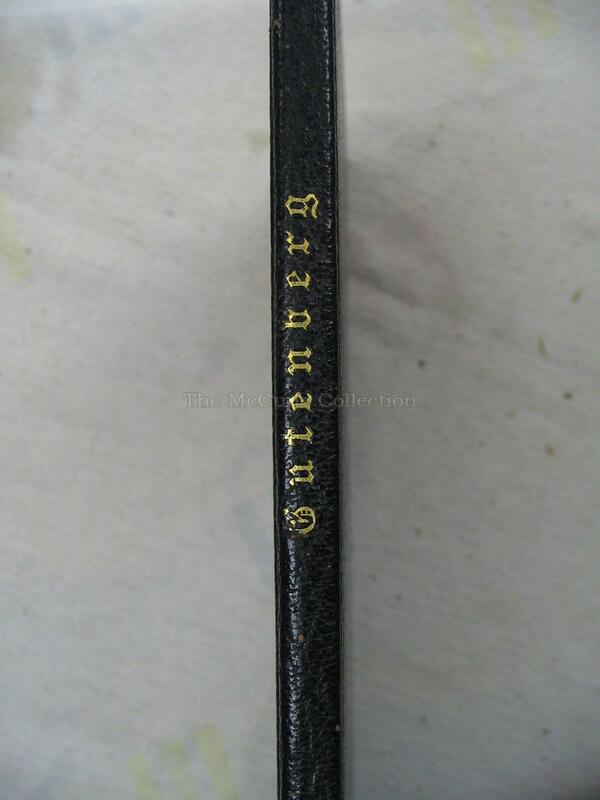 The folder has gilt lettering on its upper front cover: “A Leaf of the Gutenberg Bible (1450-1455)” with additional gilt lettering on the spine: “Gutenberg.” There are gilt decorations on the inside covers. 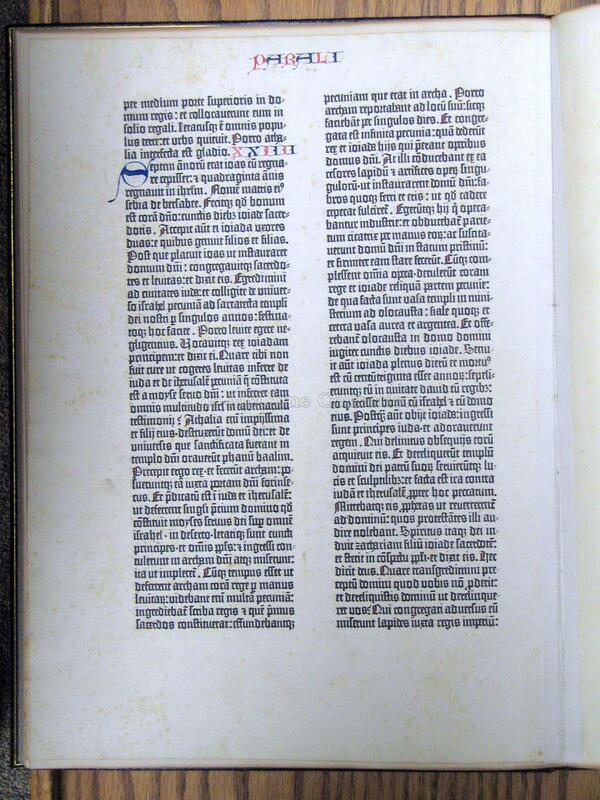 We have a leaf from 2 Chronicles (Paralipomeon Secundus) in the Old Testament. This would have been leaf 218 of the complete Bible. 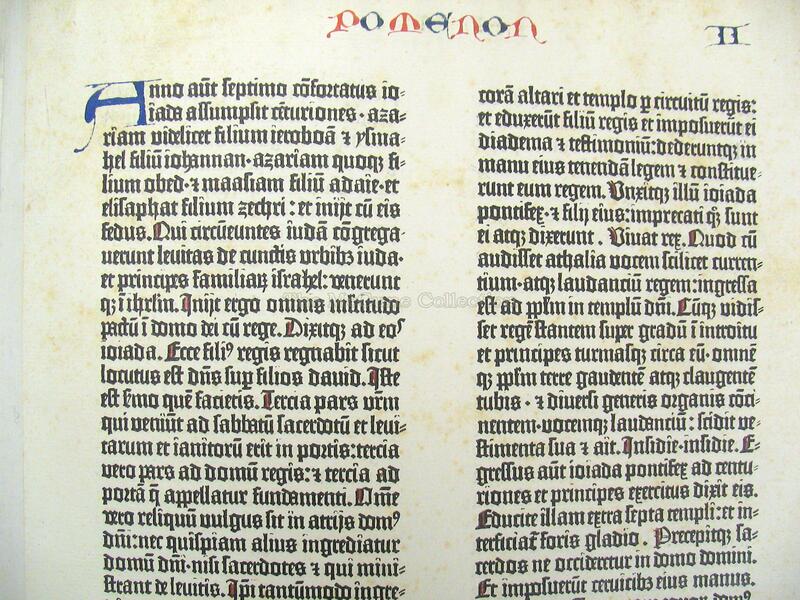 The recto side starts with Chapter 23 verse 1 and ends on the verso side with Chapter 24, verse 21. 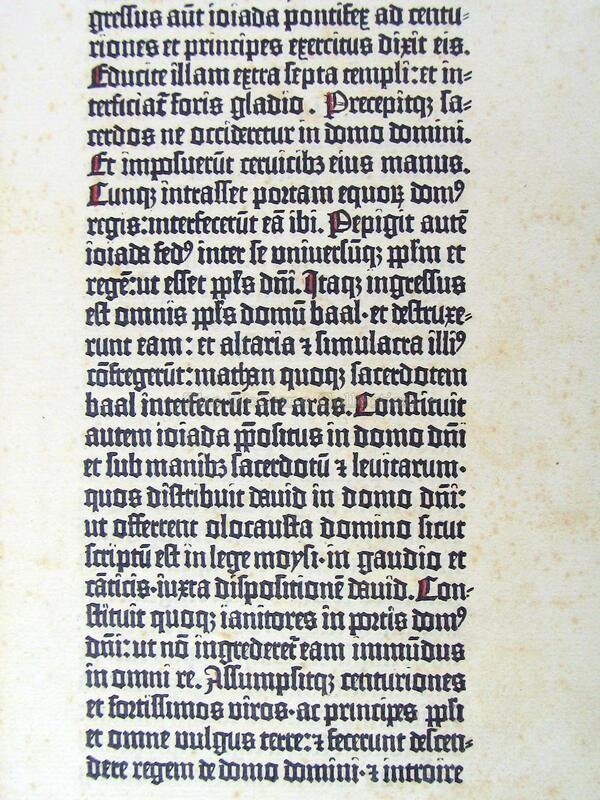 The leaf has double columns of Gothic type on each page, 42 lines to the page. 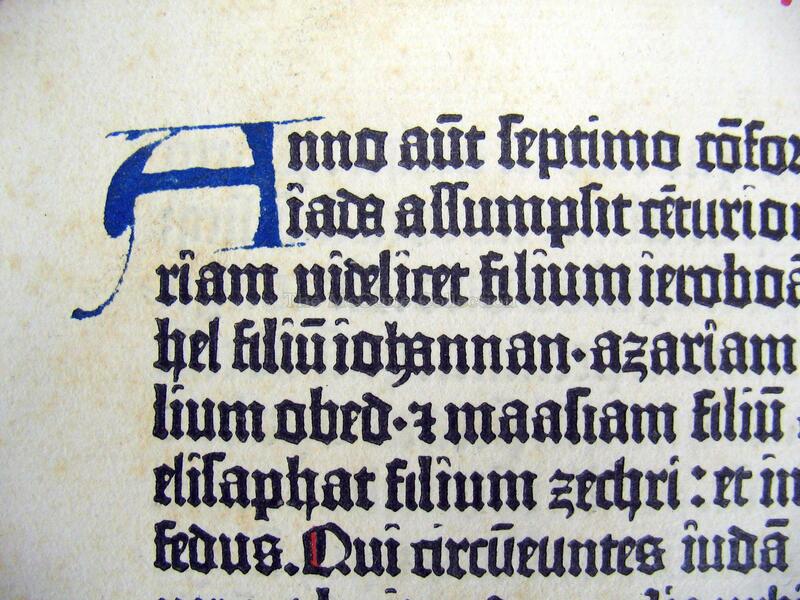 There is a blue two-line capital “A” on the recto side and a blue two-line capital “S” on the verso side. These both are chapter initials, the “A” indicating the start of Chapter 23 and the “S” indicating the start of Chapter 24. 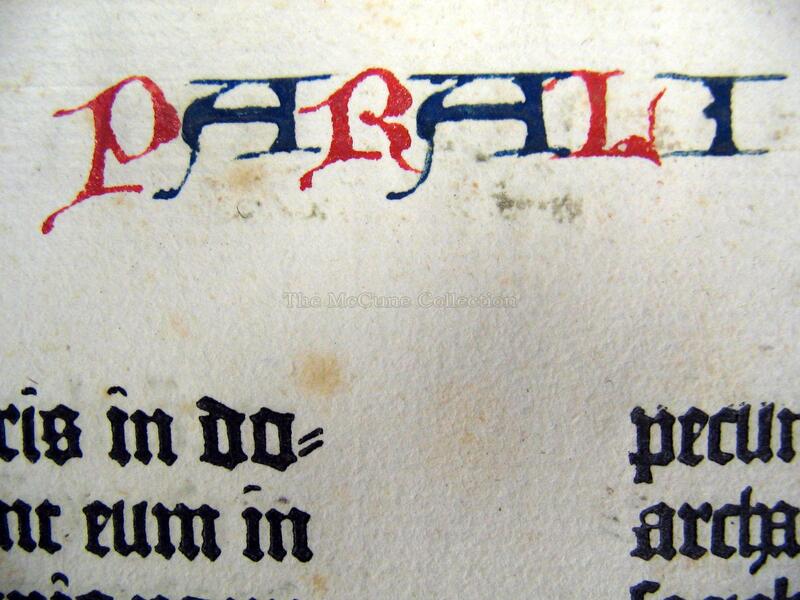 The head lines are divided (“parali” on the recto and “pomenon” on the verso). Combined they spell “paralipomenon” (chronicles). 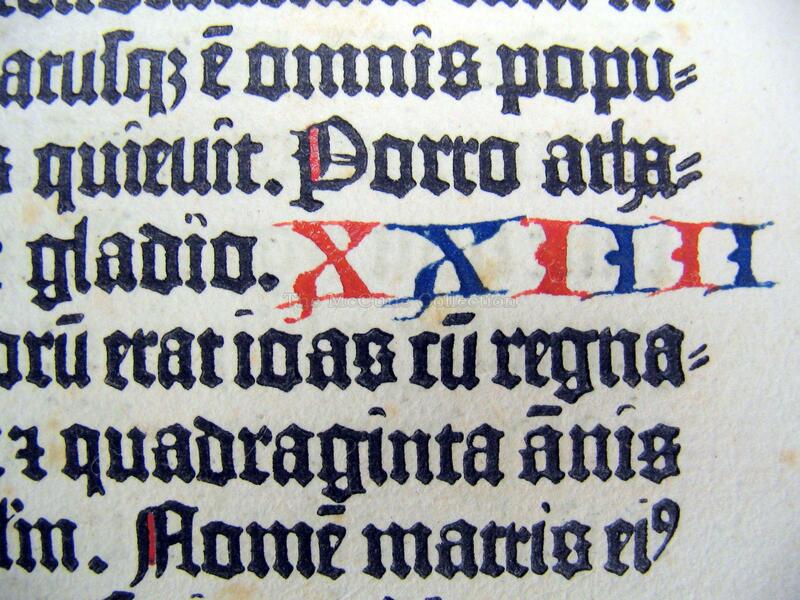 This and the chapter number (XXIII) are in alternate red and blue lettering. 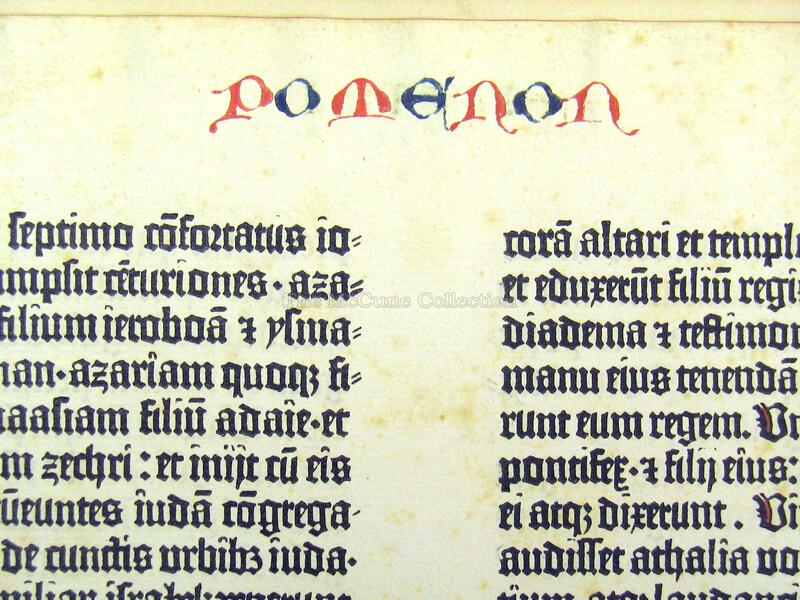 The colors were added separately by rubricators after the page had been printed and at the discretion of the buyer. 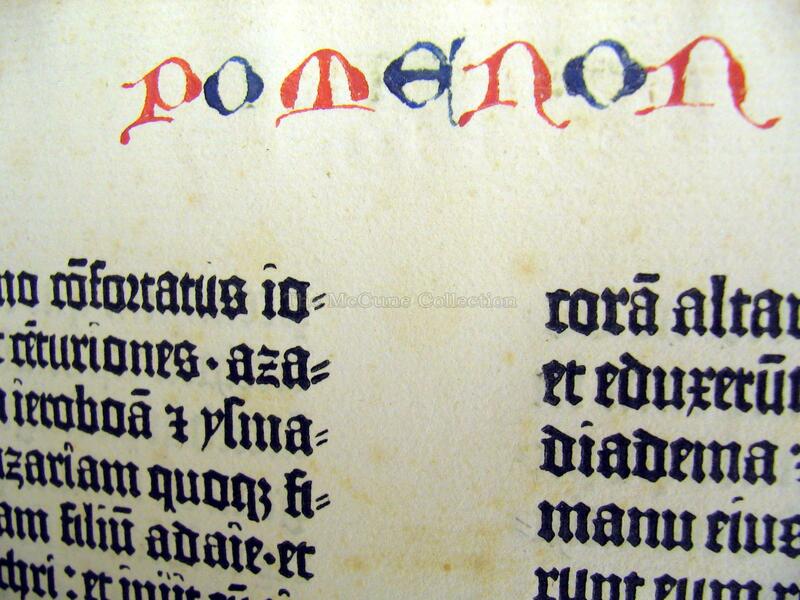 There are also red capital strokes on both pages. 23:14 Jehoiada the priest brought out the captains of hundreds who were set over the army, and said to them, “Bring her out between the ranks; and whoever follows her, let him be slain with the sword.” For the priest said, “Don’t kill her in the Yahweh’s house.” 23:15 So they made way for her. She went to the entrance of the horse gate to the king’s house; and they killed her there. 23:16 Jehoiada made a covenant between himself, and all the people, and the king, that they should be Yahweh’s people. 23:17 All the people went to the house of Baal, and broke it down, and broke his altars and his images in pieces, and killed Mattan the priest of Baal before the altars. 23:18 Jehoiada appointed the officers of the house of Yahweh under the hand of the priests the Levites, whom David had distributed in the house of Yahweh, to offer the burnt offerings of Yahweh, as it is written in the law of Moses, with rejoicing and with singing, according to the order of David. 23:19 He set the porters at the gates of the house of Yahweh, that no one who was unclean in anything should enter in. 23:20 He took the captains of hundreds, and the nobles, and the governors of the people, and all the people of the land, and brought down the king from the house of Yahweh: and they came through the upper gate to the king’s house, and set the king on the throne of the kingdom. 23:21 So all the people of the land rejoiced, and the city was quiet. Athaliah they had slain with the sword. 24:21 They conspired against him, and stoned him with stones at the commandment of the king in the court of the house of Yahweh. 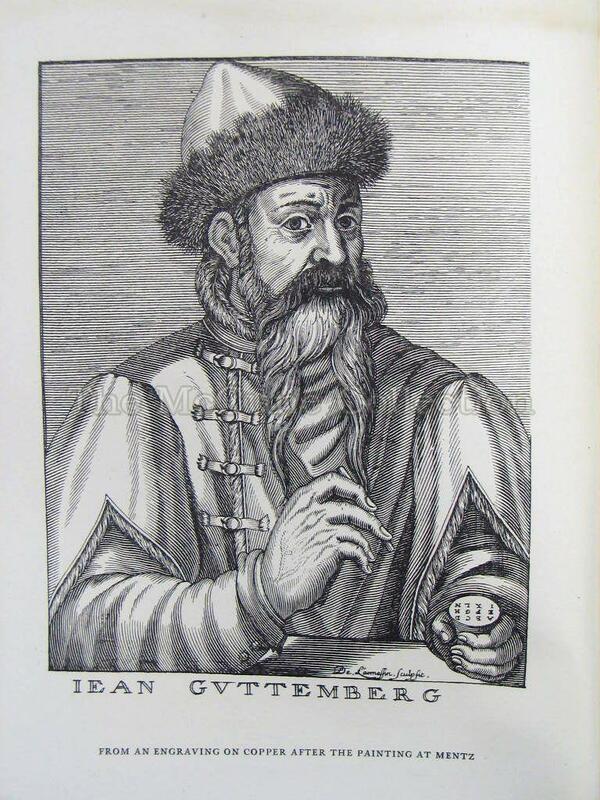 Johannes Gensfleisch zur Laden zum Gutenberg (c. 1398 – 3 February, 1468) came from Mainz, Germany. 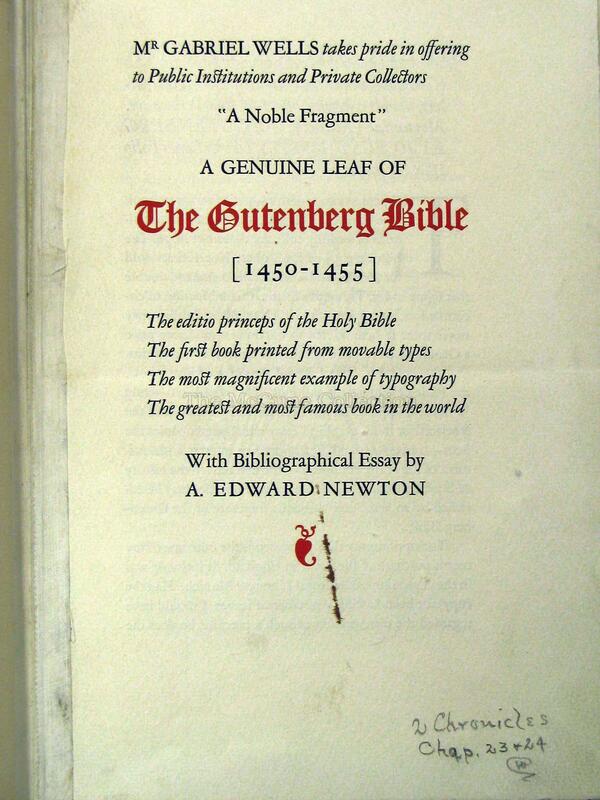 [Gensflieisch was the family name, zur Laden zum Gutenberg referred to the ancestral house of his paternal line]. He trained as a goldsmith. 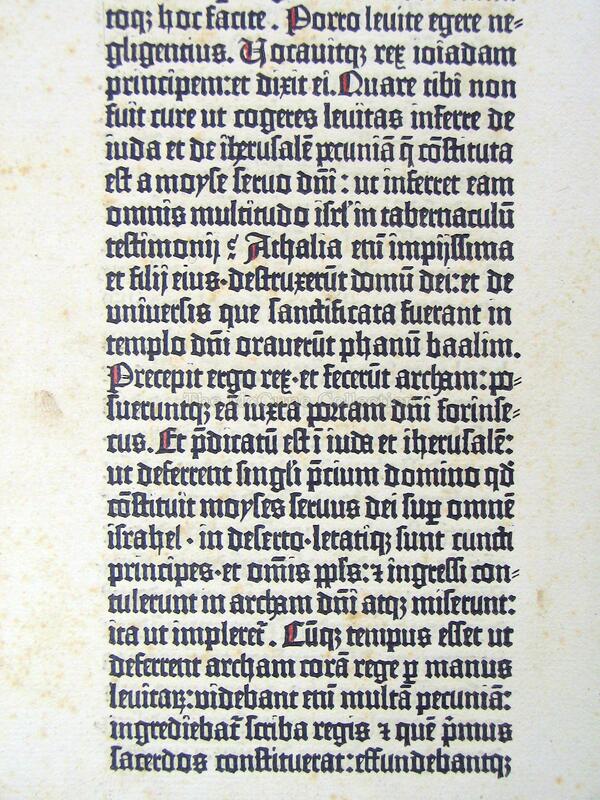 Although block printing was known and used at the time, Gutenberg worked on developing a moveable type that could be arranged and then rearranged to print documents. This required the casting of uniform letters that could be combined together to form words and ultimately a page of type. 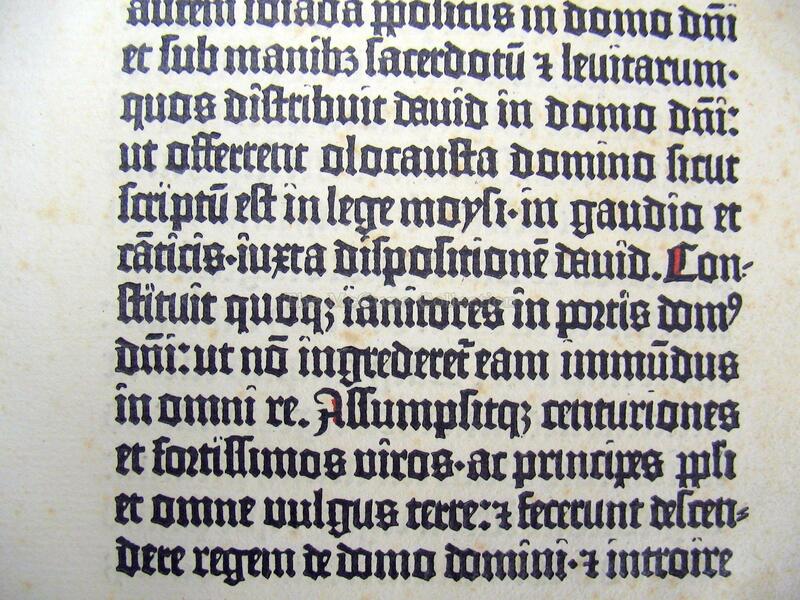 He also had to perfect a press with enough uniform pressure to apply the ink from the type to the page in a satisfactory manner. 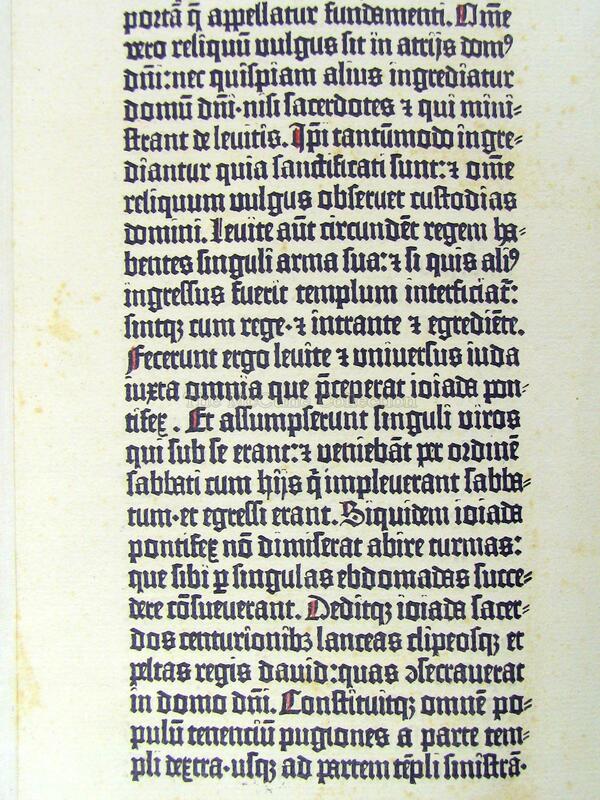 A new manner of ink had to be developed that would stick to the metal type but apply with even viscosity to the paper. 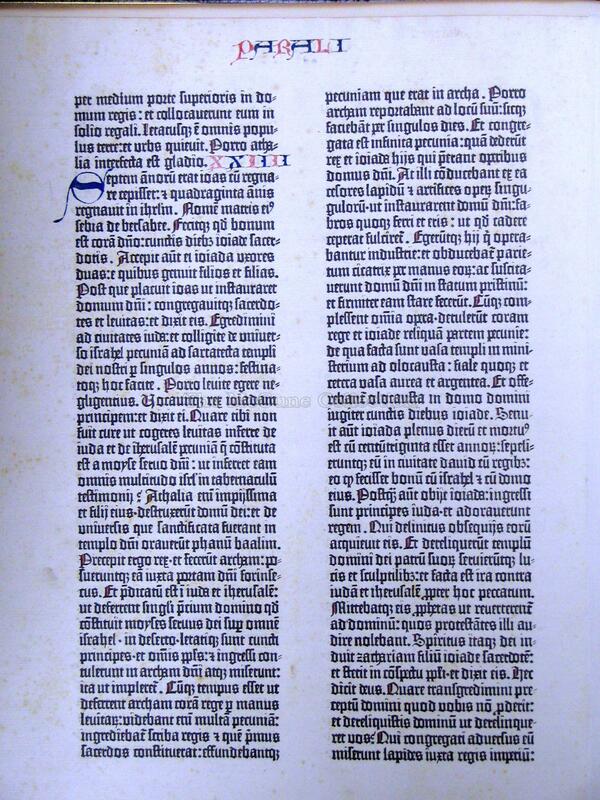 Gutenberg had to borrow money from Johann Fust in 1450 in order to continue the printing development. 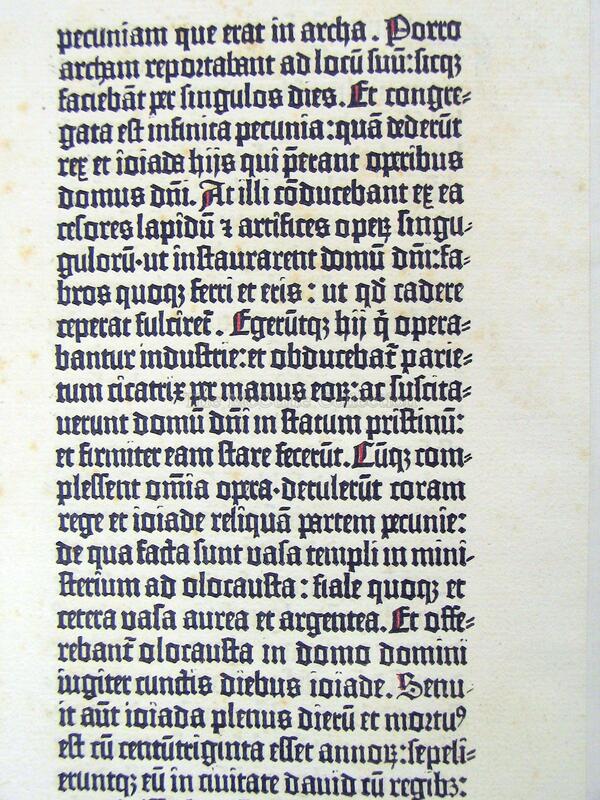 Fust later sued to recover this money and won, receiving the type (B42) used in the making of the Gutenberg Bible and the some of the equipment. 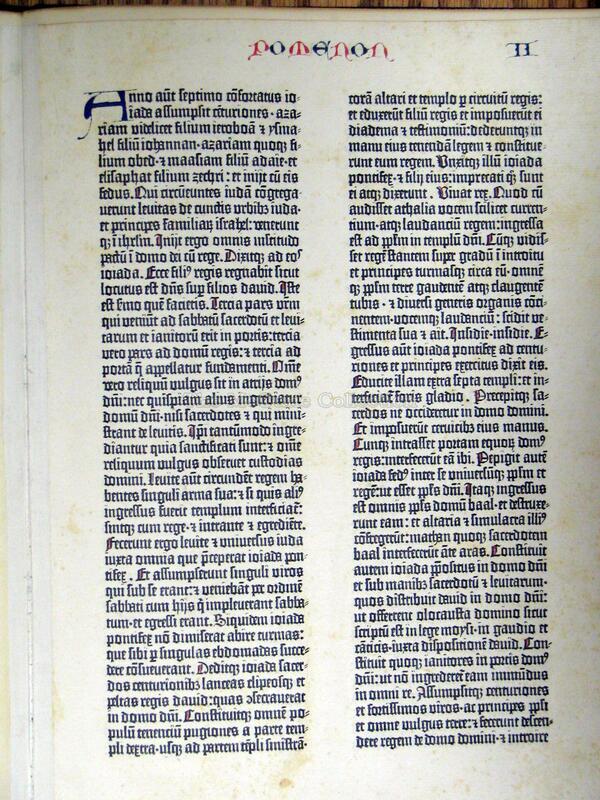 Gutenberg was able to keep some of his older, earlier type (B36) which he used to create a later edition of the bible. 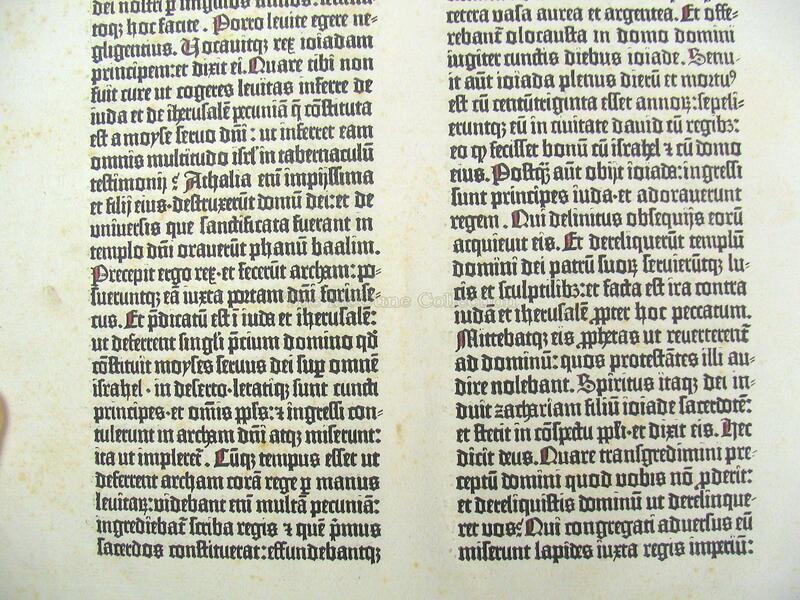 Rare book dealer who purchased the Gutenberg Bible and broke it up into the Noble Fragment. Wells, originally from Hungary, could speak eight languages. 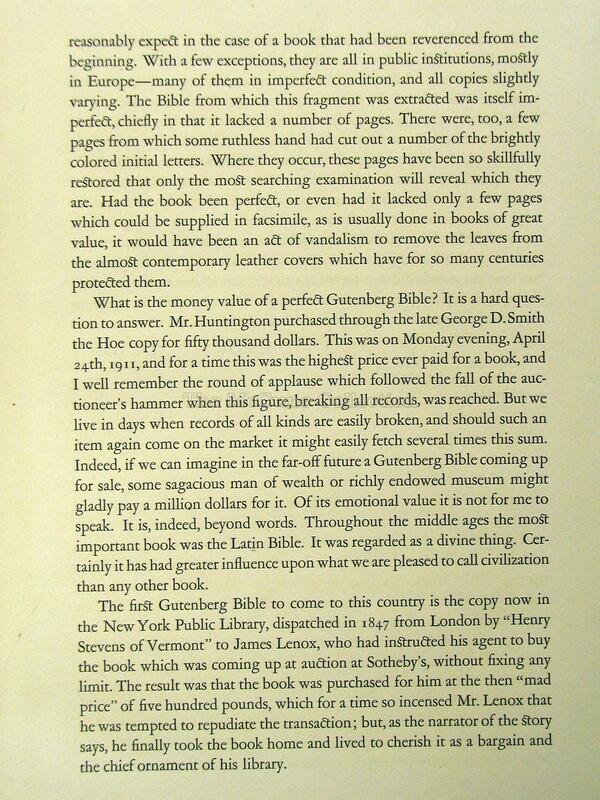 The Gutenberg Bible was not the only important article he obtained in his career – Wells also purchased in 1922 an edition of Mark Twain’s works autographed by Samuel Clemens shortly before his death ($200,000); a letter from George Washington to General Henry Knox dated 1783; the Second Continental Congress Olive Branch Petition send to George III in 1775 ($53,000 in 1935). Wells donated to the Princeton University Library an Albert Einstein autographed manuscript of a talk Einstein gave at Swarthmore in 1938 and donated to the New York Library an Evangelie Naprestol’noe (Altar Gospel) made in Moscow in 1791 decorated with gilded silver binding and enamel medallions. Author who wrote a popular book entitled Amenities of Book Collecting in 1918, which sold over 25,000 copies. Newton authored ten additional books before his death, as well as amassing a personal book collection of over !0,000 volumes. 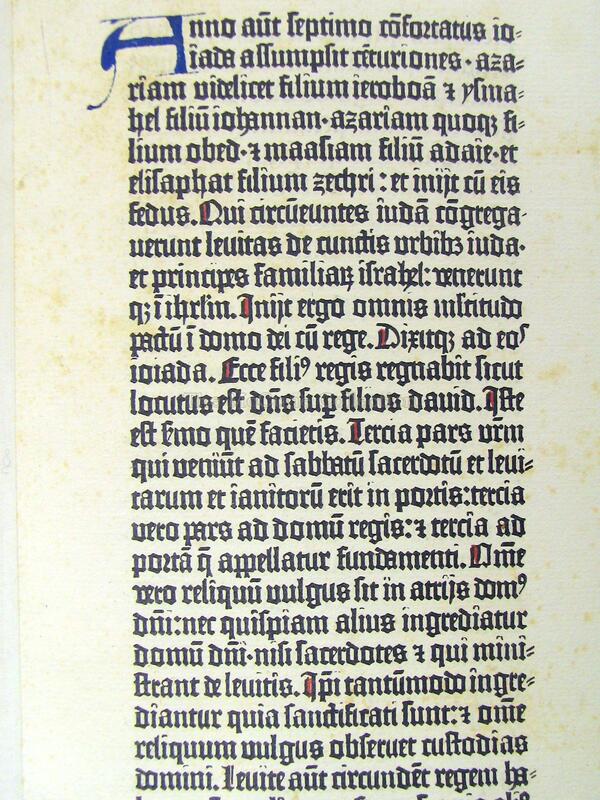 He was chosen to write the article accompanying the Noble Fragment Leaf. 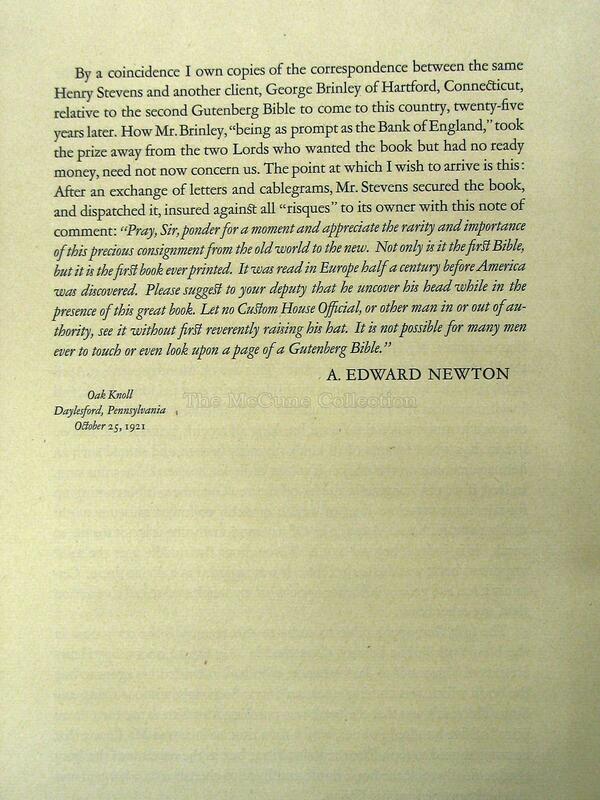 At the time of his death, Newton’s personal book collection contained approximately 10,000 volumes. Book designer/ typographer (especially known for his Centaur type). Having worked for the Riverside Press for fifteen years, he designed over sixty titles for the Houghton Mifflin subsidiary. Rogers worked for a while in New York City before he left the country in 1917 to pursue work in England at the Cambridge University Press. He returned to New York in 1919, to become an adviser of Harvard University and to design books for William Edwin Rudge’s printing firm in Mount Vernon, NY. 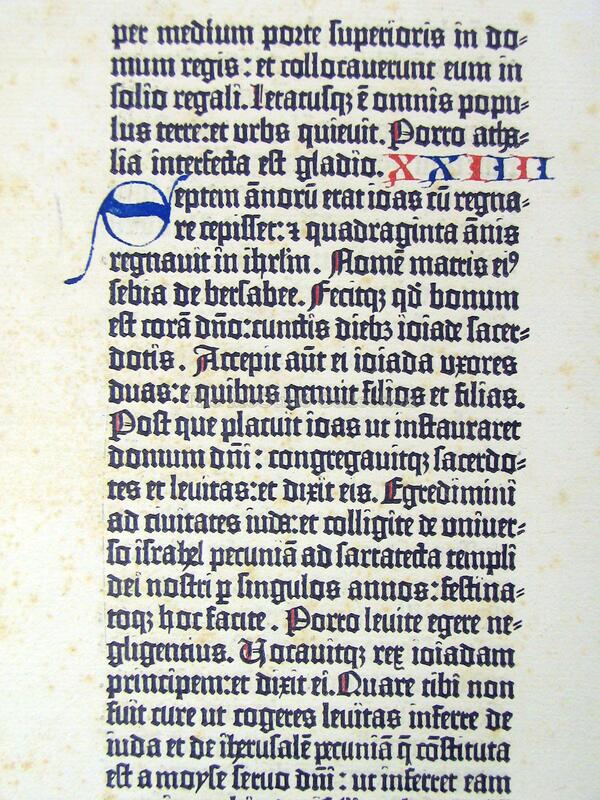 He designed the layout for the printing of the commentary on the Noble Fragment. 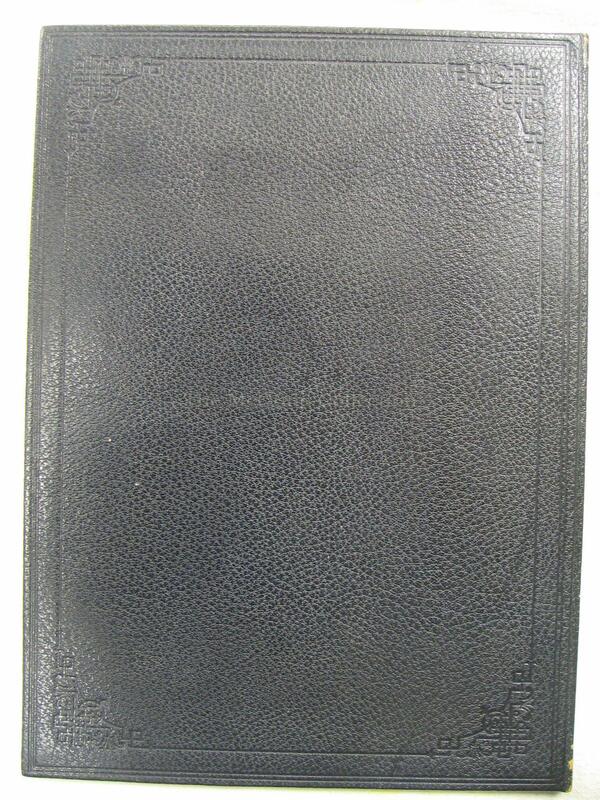 In 1935, he returned to England to design the Oxford Lectern Bible. 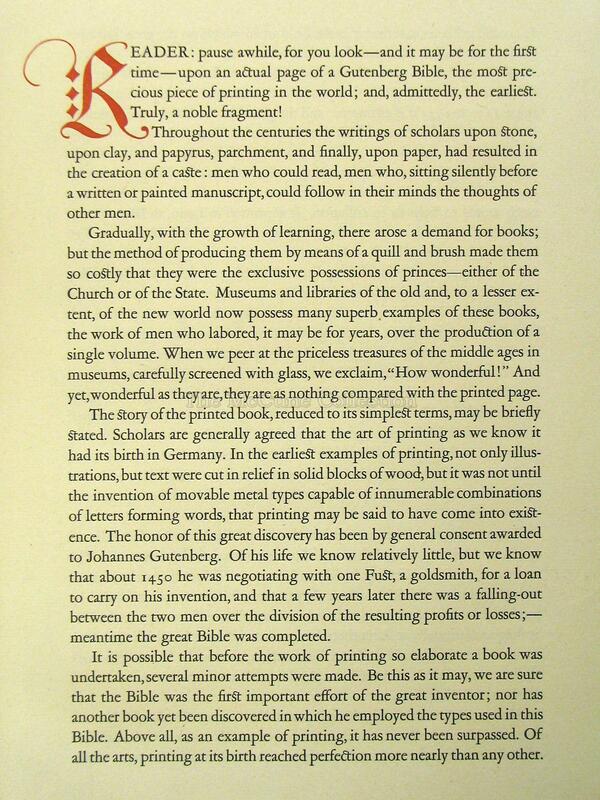 Rogers is considered one of the most influential book designers of the twentieth century. Printer, publisher, typographer in Mount Vernon, NY. His printing firm was noted for its quality work. Bookbinder. He established the bookbindery firm of Stikeman & Co. in New York City which was in business from approximately 1880 through 1932. 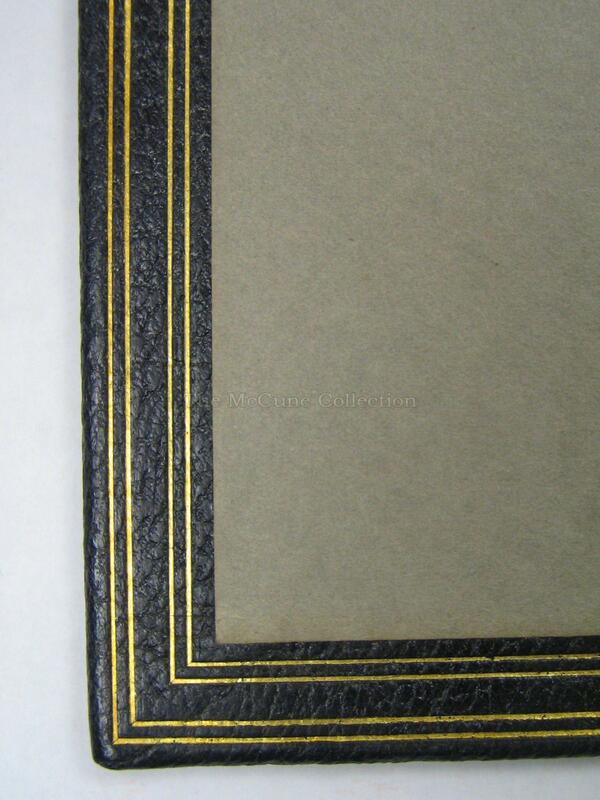 It was noted for its high quality bindings. What was a dollar worth in 1920? 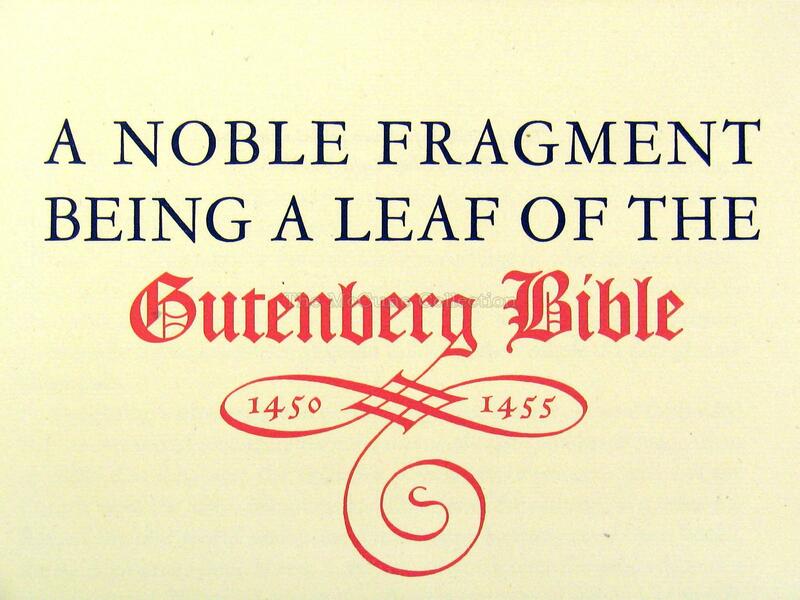 A leaf of the Noble Fragment sold for $150 each in 1920. What was the buying power of a dollar in 1920 and what would that same dollar equal today? According to Historical Currency Conversions, a 1920 dollar would be the equal of $10.78 in 2009. [http://futureboy.homeip.net/fsp/dollar.fsp]. The following are typical wages and prices for the year 1920: A new Overland Touring car was $1035. A laborer made $5.50 for an eight hour day; a telephone operator - $14 a week; a brick layer $1.25 per hour. Sugar cost $.15 per pound; baked beans - $.12 /can, lamb chops - $.38/ lb. A daily newspaper sold for $.02. A nine room house with bath rented for $100 a month in Morristown, NJ. A kitchen range sold for $94 and a bicycle was $10. [These figures are from the Morris County Library website: http://www.mclib.info/prices/1920.html]. 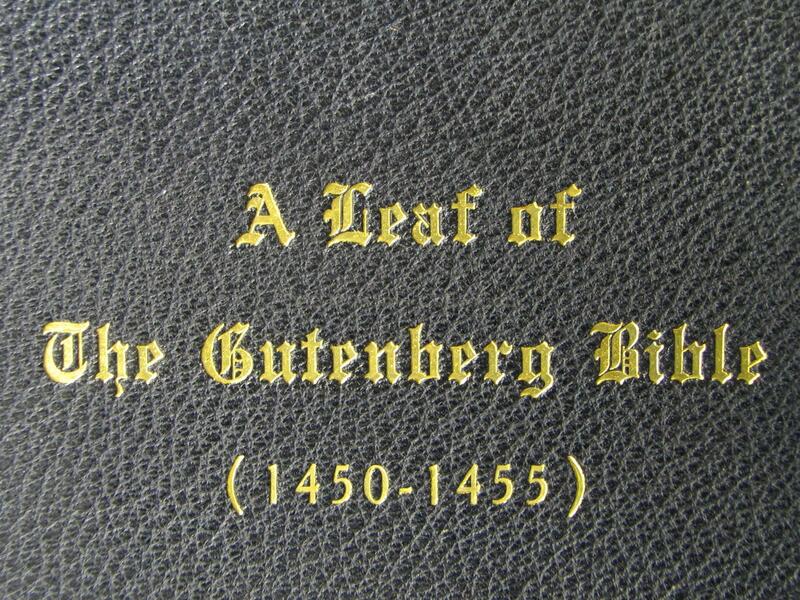 What is the value of a Gutenberg Leaf? Belgium – Bibliotheque Publique – Vol. 1 only. Missing 104 leaves. Denmark – Kongelige Bibliotek – Vol. 2 only. 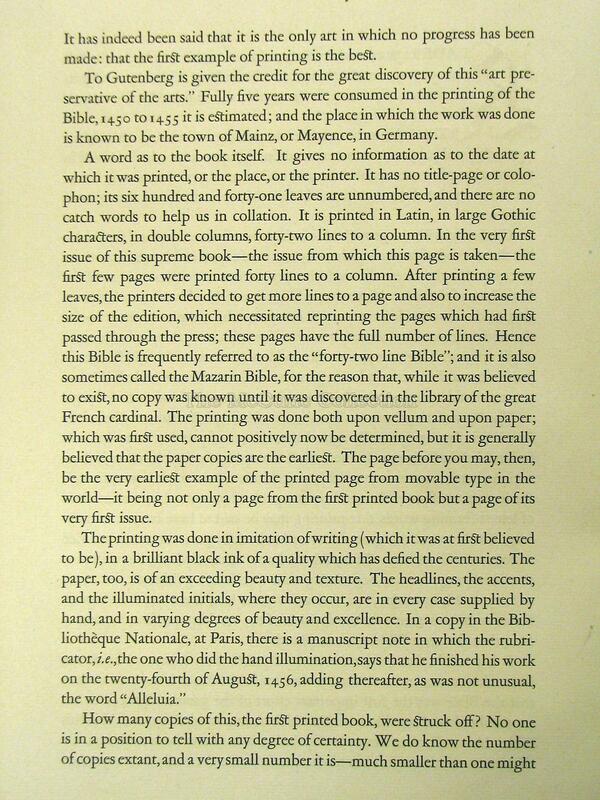 France – Bibliotheque Nationale – Missing 149 leaves. France – Bibliotheque Communale – Vol. 1 only. Germany – Landesbibliothek – Vol. 2 only. Germany – Stadtbibliothek – Vol. 1 only. 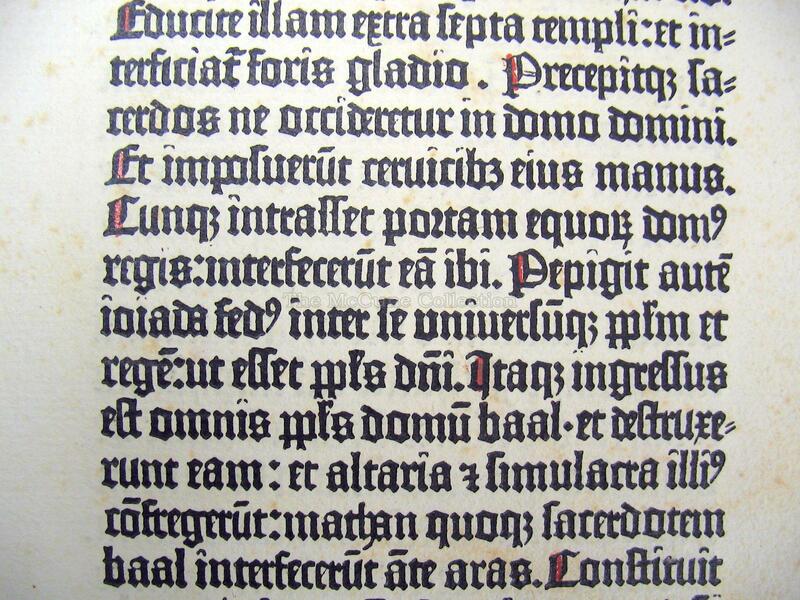 Great Britain – Archiepiscopal Library Lambeth Palace – New Testament only. 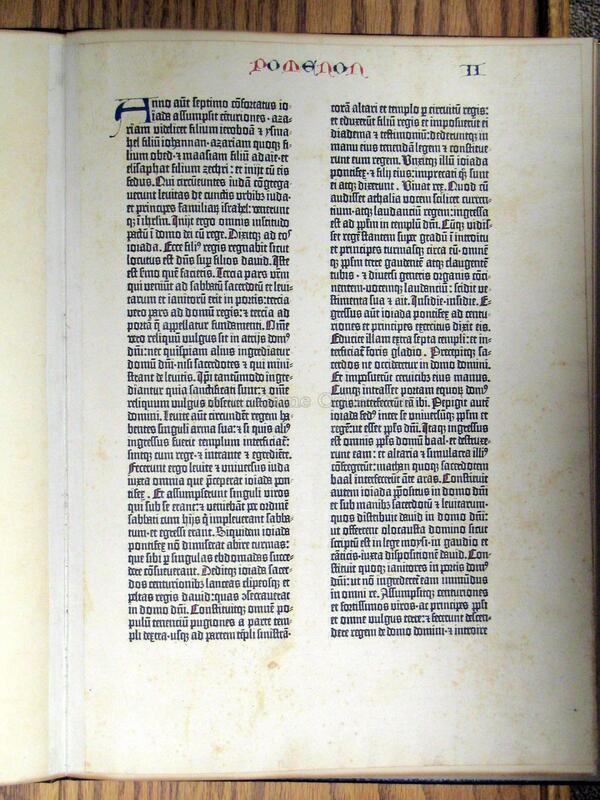 Italy – Biblioteca Apostolica Vaticana – Vol. 2 only. Japan – Keio University Library – Vol. 1 only. Spain – Biblioteca Universitaria y Provincial – Vol. 1 only. U.S.A. – Lilly Library – University of Indiana – Vol. 2 only. 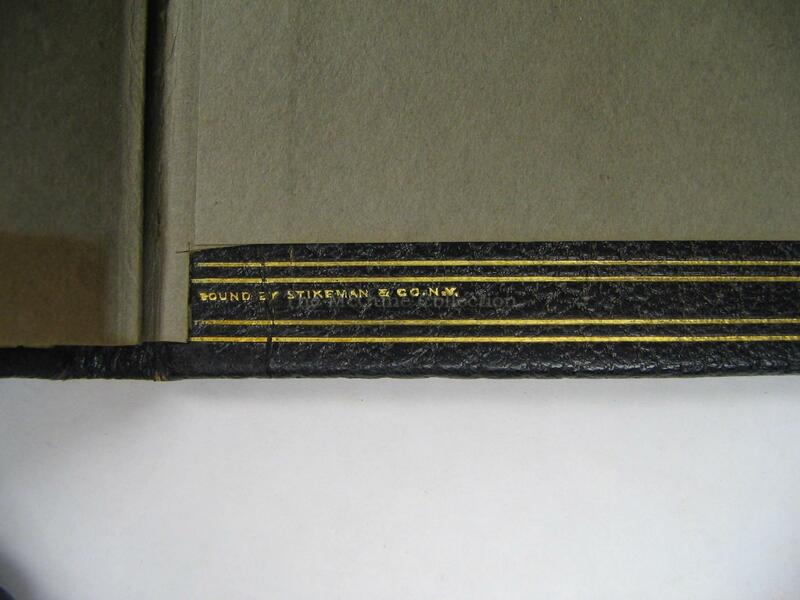 U.S.A. – Pierpont Morgan Library – 2 volumes. Missing 130 leaves.